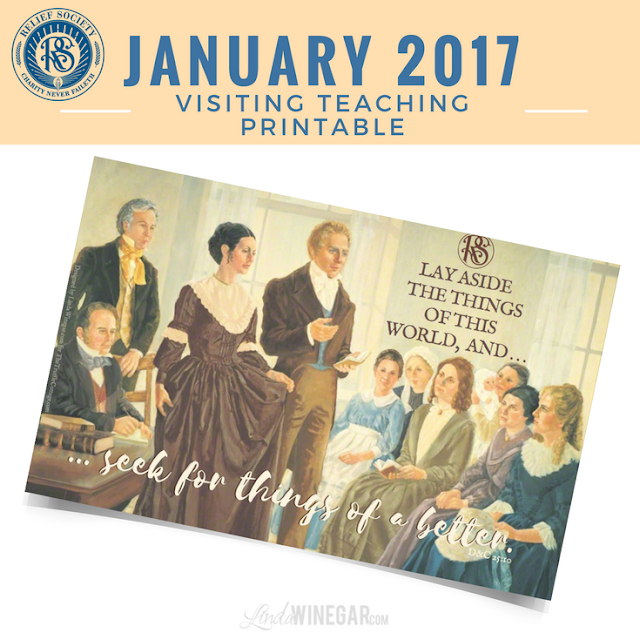 January 2017 Visiting Teaching 4x6 Handout & Relief Society Logo Treat! Free download or Ready to Gift. The Purpose of Relief Society, is to “prepare women for the blessings of eternal life,” says Linda K. Burton, Relief Society General President. How I love it when the Lord speaks directly to His chosen servants and His Daughters. I think that is why this scripture really stood out to me and I had to create a handout for it because as we liken those scriptures unto us, we can hear the Lord speak directly to us! Ok for realz, I want to add all of the scriptures right there, just read this whole section because it's amazing!!! Watch this...it's easy to put your name in there. I can't deny that He is speaking to me when I insert my name in there like that. The scripture I chose also has a "thou shalt" (a couple others in this section worth reading and pondering) and those to me, are commandments. Although I did leave that part out of the printable because there wasn't enough space and I didn't want to cram too much text in a small space where it wouldn't be legible anyways. But just know it's a "thou shalt" scripture before you download it and whenever you look at it remember it that way. This section of Doctrine & Covenants is so perfect and could have several New Years Resolutions made from it because all of it is a commandment from the Lord. In it He outlines specific things like "expound scriptures," "exhort the Church," "receive the Holy Ghost," continue learning, "lift up our hearts," "rejoice" and more. These are blessings that come from living the gospel, He wants us to use us as His instruments for good, He wants to bless us, and He wants us to be happy. 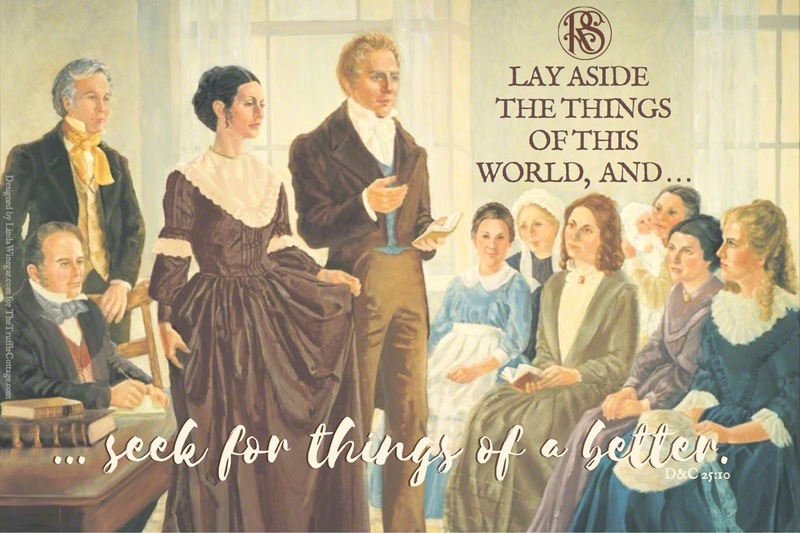 Honestly...the blessings that come from Relief Society, the things and service we can do with, for and because of Relief Society in the end are just so we can be happy. No matter how young or old, we can experience true joy and happiness that lasts forever. Sisters, I pray I can remember to "seek for things of a better" and pray you can too. 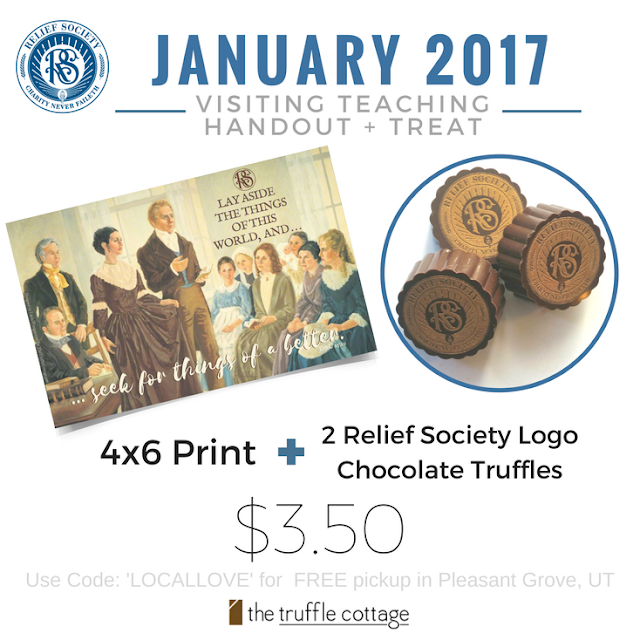 ...if you'd rather have it printed and ready to go with a delish chocolate treat in the RS Logo go to: TheTruffleCottage.com, it's only $3.50 and there's a free pickup option if you live close to their shop in Pleasant Grove, UT.